We continue to evolve and improve SHOW based on participant feedback and the breakneck pace of innovation in the arena of hepatic oncology. This year we have expanded the scope of SHOW to include hot topics including discussions on Microsatellite Instability, Immuno oncology, Right Sided Primary (RSP) in colorectal cancer, and a host of novel agents and therapies that have direct impact on your day to day clinical practise. As in the past, to keep the discussion flowing we will continue with topic-based panels and our signature ‘SHOW case based expert panels’, each designed to simulate thought and discussion. As always, the main objective of SHOW is to present practical perspectives on the treatment of HPB related cancers in the setting of community-based practice. Dr. Wendy Lam (Med Onc) and Dr. David Liu (IR) are once again co-chairing this year’s meeting. 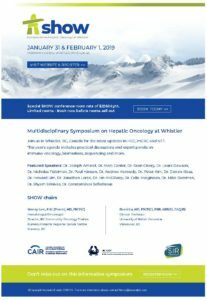 In this way, we are representing specialties involved in liver-directed cancer care to facilitate cross-specialty dialogue through case-based review, lectures and active audience participation. Our faculty consists of internationally recognized representatives from medical oncology, surgical oncology, hepatobiliary surgery, interventional radiology, radiology and radiation oncology who have embraced and incorporated multidisciplinary care into their daily practices. We will also provide a Canadian perspective on the topics. As part of our ongoing commitment to developing a comprehensive and a truly multidisciplinary program, we are proud to receive the endorsement of the Canadian Association of Interventional Radiologists (CAIR) and BC Community Oncology Trialists (BCCOT). In an effort to comply with new compliance regulations we have also changed the format of SHOW to a two full day meeting. We sincerely hope that you consider joining us at SHOW 2019. Five-day course from Monday to Friday.